Now available, "optional" extension handles! Cut your effort in half with a longer handle. 2-ton (4,000 lbs.) and 3-ton (6,000 lbs.) capacity models - dead lift rating using double line. Drag/pull rating is 2x that for vehicle extraction! The More Power Puller® has been manufactured by The Wyeth Scott Company since 1934. We are proud to state that it is the safest and most durable cable puller ever made. This heavy-duty industrial-grade portable hand winch is NOT the type of light-weight puller you will find at most home centers or discount stores. The More Power Puller® has been designed and proven to perform in a variety of demanding environments without bending, breaking or collapsing. We encourage you to compare the construction of The More Power Puller® to other brands of cable pullers on the market. 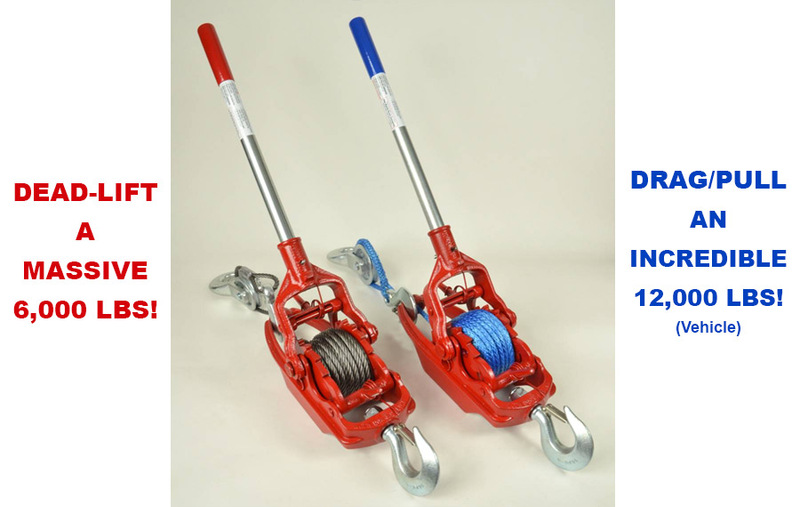 Our cable pullers are built with 26 pounds of solid iron and steel components - never light-weight aluminum. The cable model features a very capable 5/16" flexible wire rope, not the more common 1/4" (or smaller) aircraft cable. The synthetic rope model - which you will find only at Wyeth Scott - features 5/16" lightweight, stronger-than-steel AmSteel-Blue. The design of The More Power Puller® hasn't changed much in over 80 years...why would we want to change a good thing? This hand winch will last for generations. We regularly service pullers that are 30 to 55 years old, and often all they need is a new cable or spring. We are confident that you will find The More Power Puller® to be a reliable, safe, and heavy-duty tool that will prove to be indispensable.